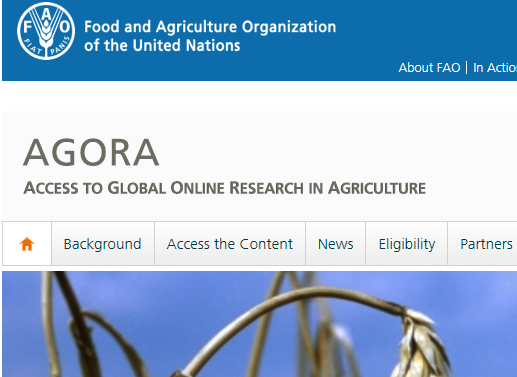 We are pleased to announce the launch of the new AGORA Web site at http://www.fao.org/agora on 9 February 2015. The main change is the new domain, clearly expressing the close relationship of AGORA with FAO. Also, the look and feel have been improved to make the use easier. The new site includes links to the newly updated AGORA training materials and the new Research4Life training portal. There is a redirect from the old site ( http://www.aginternetwork.org/ ), remaining links are still being updated to the new AGORA platform. Access to Global Online Research in Agriculture (AGORA) is a programme to provide free or low cost access to major scientific journals in agriculture and related biological, environmental and social sciences to public institutions in developing countries. Launched in 2003, AGORA provides access to more than 3000 journals from the world's leading academic publishers. Led by the Food and Agriculture Organization of the United Nations, the goal of AGORA is to improve the quality and effectiveness of agricultural research, education and training in low-income countries, and in turn, to improve food security. Through AGORA, researchers, policy-makers, educators, students, technical workers and extension specialists have access to high-quality, relevant and timely agricultural information via the Internet. AGORA is one of the four programmes that make up Research4Life.